The Galapagos Islands, Ecuador, are home to a wealth of unique animal and plant life that can be seen nowhere else in the world. Cruises to these volcanic islands offer a rich experience with trained naturalist guides, excellent accommodation and food that includes ecological consideration for the natural environment. Read more to learn about everything you need to know about cruising in the Galapagos Islands. The Galapagos Islands are the exclusive habitat for many extraordinary animals that over the millennia evolved a few different characteristics from their ancestors on the mainland. The ocean currents that brought a mixture of warm and cold water to the archipelago’s shores created a habitat where only these animals could survive. Centuries ago, some of these animals almost became extinct because of the arrival of humans who brought predators such as dogs and pigs. However, in the past four decades, these animals have made resurgence due to conservation efforts, and, today, you can see the Galapagos Islands almost as they were hundreds of years ago. What Is an Expedition Cruise? There are several different types of cruises you can take to visit the Galapagos Islands. An expedition cruise offers Captains and Deck Officers who have Merchant or Ecuadorian Navy qualifications with at least 12 years of experience. Expedition cruises also have a Medical Doctor Officer offering free consultations. This is very important, considering how remote these islands are from the mainland. When cruising in the Galapagos Islands, visiting sites may be as far as 130 nautical miles from the nearest airport. Even though the vessels are larger, expedition cruises go to all of the islands and may dispatch small boats with a trained naturalist to take passengers on land. Because all itineraries are designed approved and regulated by the Galapagos National Park, they are fixed, but one benefit of an expedition cruise is that it visits islands alone to minimize visitor impact, which means there are no other people during your tour. Your group will have the island to yourself. Expedition cruises produce their own potable water and have their own black-and gray water treatment plants to minimize the carbon footprint they leave behind. The vessel is also fitted for people with different fitness abilities. The ship has glass-bottom boats and kayaks intended to enhance your experience in the huge Marine Reserve that includes the Galapagos. You’ll be able to snorkel and swim to get a closer look. What Are the Other Type of Ships? Smaller yachts offer a more intimate atmosphere some even boast inter-connecting cabins. They serve 40 to 48 guests. The larger ships serve 90 guests and are more family friendly with social areas. There are no large cruise ships allowed for cruising in the Galapagos Islands. This is because tourism is monitored to protect the environment. There are many island-hopping tours, but make sure it covers a large portion of the BIG15 species. A great option could be one, where you fly between the populated islands (It’s a short and very interesting flight over the volcanic landscape) and combine it with day tours by boat into the National Park Islands. Look at Island 2 Island Hopping by Scalesia Lodge and Finch Bay Hotel. The La Pinta Yacht has the largest cabins with floor-to-ceiling windows in all cabins. A variety of cabins are available to choose from depending on the size of your party. Even the single-person cabins are spacious with large windows, and there are family cabins with two large beds as well as suites with a king-size bed and sitting area featuring two large windows. The lounges have panoramic windows for spectacular 360-degree views of the islands. The guests have access to a fitness room, bar, Jacuzzi and an outdoor deck for lounging or eating al fresco meals. The menus are excellent, and children are not forgotten with menus all their own. There are also children’s books, games, DVDs and much more to occupy them in between adventures. They will be able to spend some special time on the bridge with the Captain and navigators. The Santa Cruz II is a state-of-the-art expedition vessel. 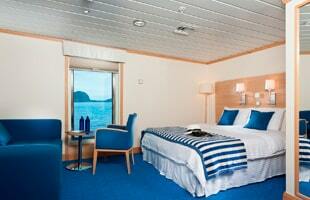 It has five decks and with 50 cabins for 90 guests with several indoor and outdoor luxury social areas. This ship is on the New York Times Top Travel List. It is also ideal for solo travellers as it provides single occupancy cabins at a very convenient rate (most ships request 100% solo surcharge). The Isabela II is a smaller, more intimate yet fully equipped excursion vessel. It is a perfect option for cruising in the Galapagos Islands! Children from 6 to 12 years old will have even more fun with special programs just for them. 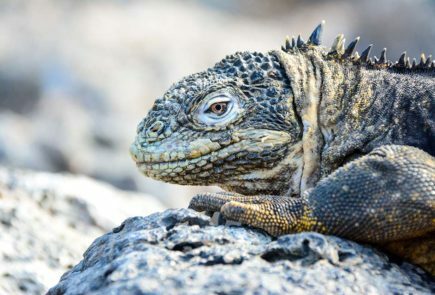 It’s important for children to understand the historical significance and delicate ecosystems of the Galapagos Islands, and onboard programs are designed to be informative and a lot of fun. Cruising in the Galapagos Islands is the optimum experience for a family vacation, offering a journey that you will never forget.